Perry defends Daniel Reed on a murder charge and against his nephew, who wants to put the old man away in an insane asylum. It�s shades of Perrygate, when the lawyer thinks Burger has bugged his office. How else could it be that every time Perry mentions something either in his office or over the phone, Burger has the information almost immediately? CARS: 1956 Buick Century 4dr hardtop, 3-tone: dark color, white, black top, Cameo: 1958 Chevrolet 4dr wagon, 2-tone: medium color & white. From The Cars by Greg Cockerill. 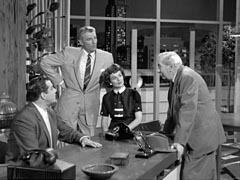 Mary Anderson, who was probably best known for her role of Alice MacKenzie in Alfred Hitchcock�s classic Lifeboat, makes her only Perry Mason appearance. She plays the wife of Arthur Space even though she is 12 years his junior, and looks more like 20 years his junior. Submitted by PaulDrake33, 7/22/2008. + Age disparity seems to have been an unofficial theme of this episode: the actors playing the two lovebirds really were 20 years apart - or more precisely 18 - but happily for the episode it isn't readily apparent. Notcom, 092117. In this episode we see Perry and Della walking into the courtroom before the trial starts. This is one of the few times we see this, as usually they are walking out of the courtroom. Submitted by PaulDrake33, 7/22/2008. Alan Lee (Dave Kemp) was the newlyweds� landlord in Rear Window, a classic Hitchcock film that Raymond Burr played in. Submitted by billp, 15 November 2009. + He reminds me of "Jake Blues" (John Belushi) in The Blues Brothers. Submitted by 65tosspowertrap, 29 April 2014. Location: About 35 minutes in, Paul and Perry arrive at the airport from Reno Nevada. This is Burbank Airport, now Bob Hope Airport, in Burbank. The tower has been modernized but the basic shape and horseshoe layout around the parking area is still the same. Burbank Airport also appears in Episodes #39, #99, #165, #220, and #258. Posted by Eric Cooper, 31 December 2009. Some pictures here. Sightings: A man known as Distinguished Gentleman #1 serves as the court reporter during the habeas corpus hearing. Distinguished Lady #1 sits in the second row during the hearing regarding Lewis�s murder. When the hearing reconvenes, we can see the man with a pencil mustache in the front row, prosecutor�s side, whispering now and then. Can you spot them? Read more about recurring but inconspicuous and anonymous actors here. Submitted by gracep, 10/2/2010. +At the 31min mark when Perry is on the phone, we see the Distinguished Lady #4 and Distinguished Gentleman #1 playing slots in the background. They both turn up in court with their winnings. Submitted by BigBill767, 12/9/16. Uncredited Actors: Additionally, the ever-uncredited Don Anderson wears a white suit as Mr. Metcalf�s assistant during the habeas corpus hearing. Submitted by gracep, 10/3/2010. + By my count, Anderson appeared in 23 of the 39 episodes in the epic first season of Perry Mason. Of course, in several episodes he had more than one role. Submitted by FredK, 15 Nov 2010. Now we know where Sgt. Brice started his career: as a Nevada state trooper! Submitted by francis, 1/24/2012. This episode--the last of the first season--is the first of two consecutive episodes featuring Joan Camden. She is also in the first episode of the second season--TCOT Corresponding Corpse. Her characters were unlucky--in both episodes, her boyfriend is the murder victim. Submitted by 65tosspowertrap, 5-3-2014. A Clever Title. "TCOT Rolling Bones" might be the cleverest of ESG's book titles. In the novel, the title has a double meaning: the more obvious relates to the tossing of dice, the more subtle--a substantial clue to the identity of the murderer--to the "disposal of the remains." Submitted by BobH, 4 March 2019. Thus ends the first season of one of the greatest shows in television history. Thirty-nine hour-long shows in 41 weeks. Raymond Burr appeared in every show, carrying the action each time. Could you imagine the movie stars of today working such grueling hours? I have read that Perry felt he owed it to the others in the cast to work this hard. Submitted by PaulDrake 33, 5/14/2009. This feels like one of the more film-noir episodes: lots of tough-talking men and women, including Kitty Kelly, with scads of 30s and 40s slang, such as when Kemp threatens Mason. Submitted by gracenote, 10/2/2010. I love it when Perry eviscerates a pompous, stuffy "expert" on the witness stand, as he does here to Dr. Norris, with an assist from the terse, dour, skeptical Judge Treadwell, wonderfully played by Richard Gaines. Also, this is yet another episode featuring an unhappy marriage. Submitted by 65tosspowertrap, 2 May 2014. + I like His Honor's use of the term SHANGHAIED [Naut. to obtain a sailor for the crew by unscrupulous means, as by force or the use of liquor: Web. Enc. Unab. Dict.]. Mike Bedard 5.25.16 MeTV airing. Although I'm not sure, I think the shot we get of the murder victim in this episode--although brief--may be the most graphic of the first season. The knife sticking out of his back is plainly visible, and there's even a hint of blood. TV shows in the '50's and '60's were very squeamish about showing blood. That would all change with MASH. And today's "crime and punishment" shows seem to go out of their way to gross out the viewer with blood and gore. Submitted by Alan Smithee, 5-4-2014. + "And the Southern girls with the way they talk, they knock me out when I'm down there." In #37 TCOT Black-Eyed Blonde Texan Phyllis Coates does sound to me like she's from Wichita Falls. Maybe that's because she's just a young farm-woman in that episode, but I love the sound of her voice. lowercase masonite, 2/1/16. How well do Donna Knox and bank teller Olan Soul� know and trust each other? In the beginning of the episode Soul� unemotionally hands over to Miss Knox stacks of bills totaling $20,000 -- $166,000 in 2016 dollars -- without either person counting it out in front of the other before Miss Knox quickly picks up the money and leaves the bank. lowercase masonite, 2/1/16. Dialog error? When crooked detective Kemp is telling the Scotts about uncle Reid getting taken he says "you people ought to know the score before Maury Lewis and his girl can take your uncle for every dime they have." I think he was supposed to say "... every dime he has". Kilo 12/28/2018. Perry had a security breach in the previous episode, and he has a more serious one in this episode when someone breaks into his office and plants a bug. Perry needs to seriously beef up his office security. And you'd think that Paul--a private detective--would know that the first place to look would be the phone. Sometimes I wonder about Paul... Submitted by 65tosspowertrap 4-29-14. If the killer's motive, "...to get away from her!" sounds familiar, it was also the motive in Ep. 1, TCOT Restless Redhead. On balance, I think the actor in Ep. 1 delivers it more effectively than does the actor here. Submitted by alan_sings 11/29/2014. + I think it has more to do with the personalities of the characters: Ep.1 was bitter - one might even say slightly crazy - whereas here he seems resigned and indifferent...maybe he should be tested for dementia praecox ! Submitted by Notcom, 092117. After finding out what happened in Alaska 30 years previously, I idly wondered about the statute of limitations for attempted murder. Perhaps the victim was more concerned about losing face for reporting the attempt than about walking out on a pile of money? lowercase masonite, 2/1/16. + Alaska became our 49th State in 1959; it was still a Territory on 06/28/58. Mike B. 5.25.16.